Ambulance workers last night treated 125 causalities -- mostly teenage girls-- during the Beatles' opening concert for their British tour in the Odeon Cinema, Glasgow. Any suggestions that the group's popularity may be dwindling were shattered by a wildly enthusiastic reception from capacity audiences. Sighing, sobbing, screaming or simply "sent" the crowd inside the theatre yielding such a steady stream of casualness that the foyer at times resembled a battleground. During the first house there were 65 cases, five of whom were sent to Glasgow royal Infirmary and in the second house there were 60, one of whom was sent to hospital. An official of St. Andrews Ambulance Association said 37 of those treated were fainting cases and 88 were suffering from hysteria. One ambulance worker complained, "Give me a Ranger-Celtic game any day. This is just too much." Stretchers, smelling salts and sponges were overworked by more than 100 ambulance workers throughout both performances. 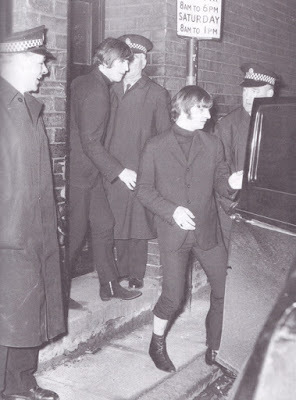 But the cinema manager, Mr. George Chantry said the Beatles show were "must quieter" than their last visit. Last night's performance opened an 18 concert British tour and each night was old out on the first day booking opened. For the Glasgow shows, more than £800 in postal orders had to be returned to intending patrons for the 3000 seats. George Harrison appeared at last night's show with a hastily borrowed guitar after his own had been run over by a lorry when it fell from the boot of their car on the A1 near Berwick-on-Tweed. "My special favorite - -smashed to bits," he bemoaned at a news conference before the show where the group faced a battery of 30 photographers and pressmen. He added that when they found the remains of the guitar it, "looked as if it had been run over by about ten lorries." 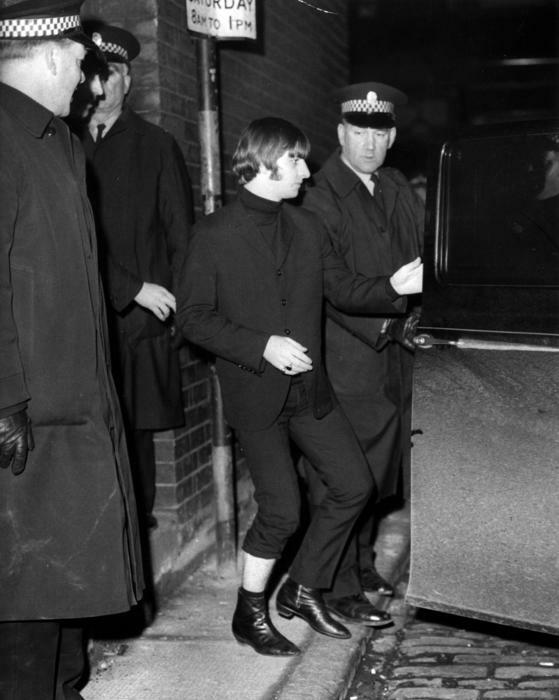 "It's out of tune now," quipped John Lennon. 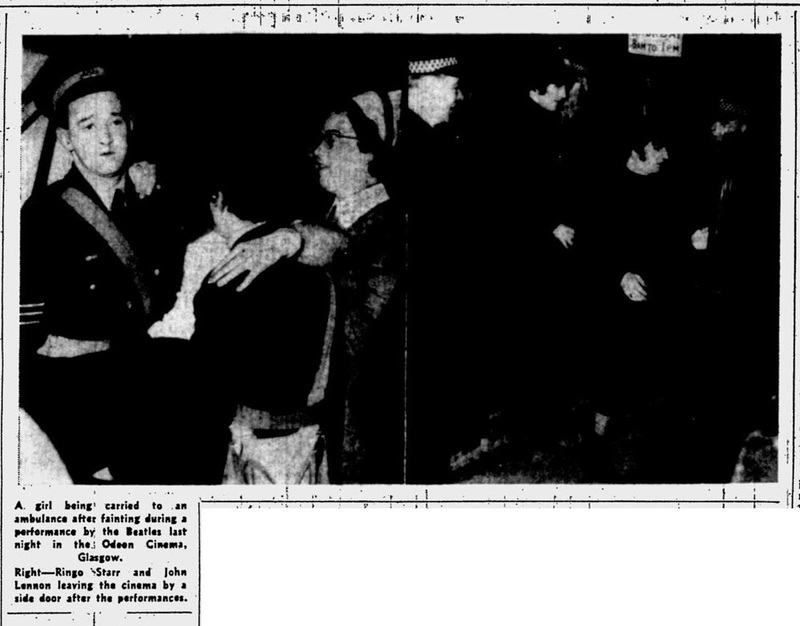 Two solid lines of policemen were on both sides of the road at the Renfield Street-west Regent Street junction to control the crowds after the performance, but six mounted police drafted from Hampden Park earlier were not needed. Radio "walkie-talkie" equipment was used however. The Beatles are due to leave Glasgow this morning by car to appear in Newcastle-upon-Tyne.